dealnews.com is the flagship site for a network of six online shopping guides that obsessively hunt down the best deals on consumer electronics, computers, apparel, home furnishings, and more. The first stop for smart shoppers and bargain-hunters, dealnews was named �one of the best services of 2006� by PC World. Also, don’t miss this great segment on dealnews on NY1. 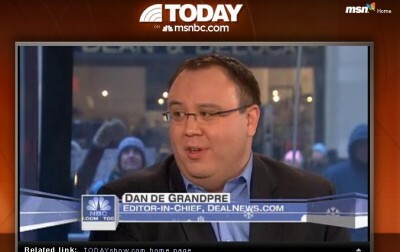 PKPR booked a great segment for Dan de Grandpre, the founder and editor of dealnews.com, on The Today Show on December 23rd to discuss last-minute holiday shopping deals. Check out the segment below. Over the last three years, PKPR has helped position Dan de Grandpre, the founder and editor in chief of dealnews.com, as a consumer advocate and online bargain-hunting expert. With the economy struggling, Dan’s advice is needed now more than ever. As the holiday shopping season kicked into high gear this past week, PKPR secured Dan several high profile, national interviews including NPR’s Weekend Edition, American Public Media’s Marketplace, Fox & Friends, CBS News Radio, and Lou Dobbs Radio. dealnews was also highlighted in hundreds of outlets as a money-saving resource for holiday shoppers, including USA Today, New York Times, SmartMoney, Kiplinger, Marketwatch, and Forbes. To cap off the holiday season, PKPR secured a profile of dealnews founder Dan de Grandpre—and his personal tips for last-minute holiday shopping—in the Wall Street Journal today. MKPR developed a comprehensive strategy aimed at positioning dealnews as the leading source for intelligence on Black Friday sales and deals. Founder Dan de Grandpre appeared on outlets from Fox & Friends to Good Morning America Now to CW11 Morning New to discuss shopping tips and participated in a satellite TV tour and morning drive radio tour in more than 20 markets around the country. dealnews has also been featured prominently in coverage leading up to Black Friday, including PCMag.com, Smart Money, AP, USA Today, and Forbes.com. For the 2006 holiday shopping season, PKPR developed an aggressive PR campaign for our newest client, dealnews (http://dealnews.com), the web’s leading guide to the best deals on consumer electronics, gadgets, apparel, and more.